At the end of six-game road swing, the Maple Leafs faced arguably their toughest test of the trip on Tuesday against the St. Louis Blues. And it was a battle from start to finish, with Toronto overcoming a two-goal deficit to force overtime, before falling 3-2 in the extra frame on Ryan O’Rielly's game winner. The Leafs finish their road trip with a 3-2-1 record, while sitting at 36-19-4 on the season. Each period of Tuesday’s game in St. Louis told a different story for the Maple Leafs. In the first, they were sloppy and outmatched, evidenced by their 2-0 deficit. In the second, the Leafs played tighter, but couldn’t cut into St. Louis’ lead. By the third, Toronto had grabbed hold of the momentum to tie the game with two goals in 31 seconds. That’s when things really heated up. As it was, the Blues were already the hottest team in the NHL going into Tuesday’s tilt, not just riding a 10-game win streak but coming off three straight shutouts, and they hadn’t trailed in a game since the third period against the Florida Panthers on Feb. 5. St. Louis created havoc against Toronto from their first shift, while the Leafs’ attack was far more controlled and lacking the same second chance opportunities. Part of that was Blues goaltender Jordan Binnington, who controlled rebounds and slowed things down in the offensive zone. The other part was Toronto’s inability to contend with the Blues’ pressure and relentless forecheck, which forced the Leafs into giveaways that fed St. Louis’ game. Jaden Schwartz finally capitalized on one such turnover, giving the Blues a 1-0 lead while capping off an unfortunate sequence by the visitors. Toronto was slow getting back in transition on the play, and Jake Muzzin turned the puck over right before blowing a tire along the boards to leave no one on Schwartz next to Frederik Andersen as he potted the game’s opening score. Colton Parayko’s booming point shot made it 2-0 Blues on the power play before the end of the first period. Now in a multi-goal deficit, Toronto came out far better in the second, winning more puck battles and showing some fight. They were also down a man, too, with Nazem Kadri sitting out the remainder of the game with a concussion, and William Nylander compensating for the loss by moving to centre. Binnington, though, remained the star that his recent 8-0-0 record would suggest, even as Toronto forced him into a career-high 25 saves before the end of the second. It wasn’t until the third that St. Louis’ shutout streak finally came to a halt at 233:50, when Zach Hyman put a puck on net from below the goal line that bounced off Binnington and in. Just 31 seconds later, Auston Matthews was in front of the net jockeying for position, and snuck a puck under Binnington to tie the game and turn the pressure all the way up as both teams traded chances until the end of regulation. O’Reilly ended overtime in a hurry, making a great defensive play at one end and scoring off the rush at the other. The single point Toronto did get was ultimately well-earned, reflecting some adjustments made in the second and third periods to combat St. Louis’ more suffocating physical play, but the game also showed cracks in Toronto’s ability to stand up to heavy, veteran teams. Even in a low-energy first period for the Leafs, Matthews had extra pep in his step against St. Louis, and was a consistent threat for Toronto in the offensive end. As the game wore on, and the Leafs had to overcome for Kadri’s absence and their own fatigue in the finale of a two-week road trip, Matthews only got better, until he began taking over in the third. Each shift Matthews stepped on the ice for at that point was filled with purpose, and he took advantage of every battle, shot and pass to try and eat into the Blues’ 2-0 lead. When he finally scored the equalizer, it started with good positioning in front of Binnington, but it was the culmination of a game’s worth of determination from the 21-year-old to be a difference-maker. While the goal had an immediate impact for Toronto, it was also a milestone of sorts for Matthews, marking the first point of his career against St. Louis. In five previous meetings, Matthews had failed to record a goal or assist, the only NHL team he hadn’t tallied at least one point against. Being away from Toronto has been good for Matthews since he entered the league, though. His goal in St. Louis was the 59th he’s scored on the road going back to 2016-17, second-most in the NHL over that span. Matthews finished Tuesday’s game even with two shots on goal. 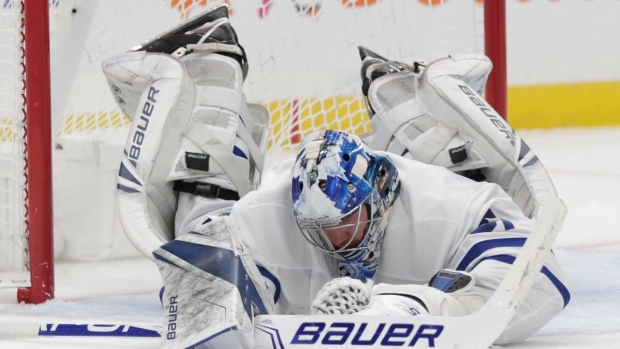 While Binnington was standing on his head at the other end of the ice, Andersen had to do his part to keep the circling Blues from running away with the game. Andersen hasn’t had the best run against St. Louis of late, dropping seven straight contests going into Tuesday night. That luck didn’t improve much in the opening period, first when Andersen was left out to dry on the great setup and execution of Schwartz’s goal, and then when Parayko’s shot snaked through traffic and beat him high off the post. The Blues’ third and fourth lines started the game with great pressure, too, and Andersen barely had a moment’s rest as St. Louis registered nine shots on goal in the first six minutes of the first, and had 32 shots on net after 40 minutes. When the Leafs’ overall game picked up in the second period, Andersen shut the door behind them with more sequences of great saves, benefiting from a few fortuitous bounces that kept pucks from getting behind him. Andersen didn’t have the same control of his rebounds that Binnington showed and had to fight through more heavy traffic from the Blues in front of him, making the stops more difficult. Andersen was in solid position throughout the final two periods and especially into the third, challenging the angle of St. Louis’ shooters and limiting some of those rebounds that popped out in the first. After two periods of strong play, Andersen was facing down a two-on-one rush, with Morgan Rielly between O’Reilly and Vladimir Tarasenko, and was beat cleanly on O’Reilly’s game-winner. It was a disappointing end for Andersen, but his prior steadiness was a pillar of the Leafs’ comeback, and his efficiency and confidence was integral to Toronto reaching overtime at all. He finished with 38 stops and a .927 save percentage. Toronto’s penalty kill has been a bright spot lately, going 8-for-8 in the team’s last four games before Tuesday. Much of that has been a credit to the aggressiveness of the kill, chasing down loose pucks and creating shorthanded chances. There was more where that came from in St. Louis, and the penalty kill was called upon late in the game to try and keep Toronto in striking distance. While Parayko did get his shot through traffic to convert on St. Louis’ first power play, the second and third kills for Toronto, that happened at the end of the second period and to start the third, were critical in holding the Leafs’ deficit at two. Mitch Marner was terrific on the kill in that sense, stealing pucks and winning races to keep the Blues hemmed in their own end with the extra man. Connor Brown and Kasperi Kapanen were important in that respect, too, using their speed to keep the Blues off balance and away from quality scoring chances. The Leafs’ regular season continues to wind down, and still they’re waiting to see the entirety of the lineup healthy and going at full speed. Between injuries to Matthews (shoulder) and Andersen (groin), among others, and Nylander’s two-month long contract stalemate, key pieces have been missing or slowed for Toronto throughout the season. With Andreas Johnsson back in on Tuesday after missing one game with a leg injury, and Nylander turning a clear corner the last couple of games with some high-octane play, the Leafs were close to all hands on deck against St. Louis. And then another potential domino fell. When Toronto came out for the second period, Kadri wasn’t on the bench, and wouldn’t return to the game for what the Leafs called “precautionary reasons.” Later, Toronto clarified Kadri was suffering from a concussion. It’s likely that Kadri was injured early in the first period, when Vince Dunn levelled him with a crushing hit. But whatever caused the issue, it’s how long the concussion projects to keep Kadri out that could influence Toronto’s plans for this Monday’s trade deadline. While Nylander can fill in at centre and has in the past, coach Mike Babcock has made no indication he wants to see more of Nylander at that position. Toronto can move Par Lindholm back to the middle and insert Tyler Ennis on the fourth line wing, setting up a tandem of Lindholm and Frederik Gauthier on the third and fourth lines respectively, but if Kadri’s injury is anything serious, the team may be persuaded to go out and acquire some more insurance at centre for the tail end of the season before it’s too late. At the moment, the only NHL-tested centre Toronto has in the organization on a two-way contract is Josh Jooris (213 NHL games), who’s currently centring the fourth line of the American Hockey League’s Toronto Marlies. Toronto is 7-0-2 when Zach Hyman scores a goal this season. The Leafs return home to face the Washington Capitals on Thursday.